03 Jan	This entry was published on January 3, 2013 at 4:06 am. It’s filed under American cuisine, food, food photography, vegetarian and tagged American cuisine, cherry tomatoes, dinner, food photography, pasta, vegetarian. Bookmark the permalink. Follow any comments here with the RSS feed for this post. YUM!! I love this kind of pasta! 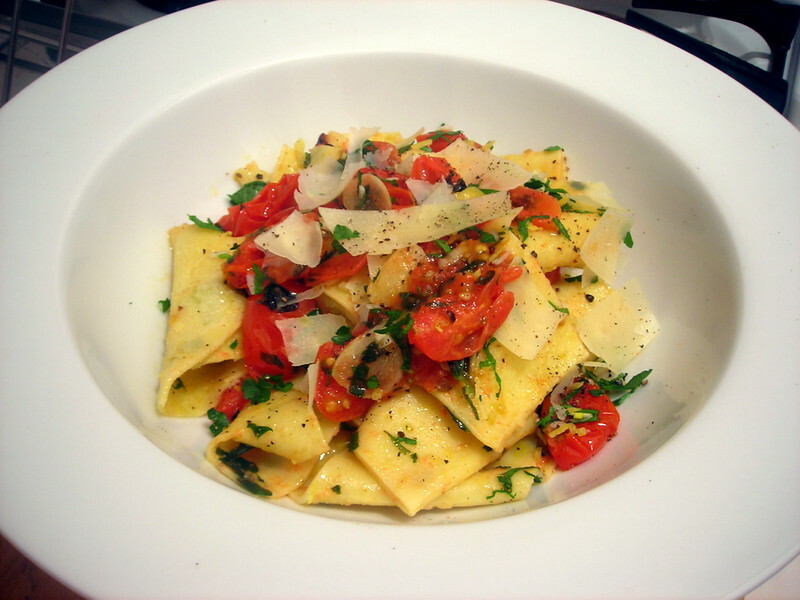 One of my 2013 food resolutions is to learn how to make fresh pasta. The ingredients cost pennies, and the satisfaction derived from making something from scratch is indescribable. I make fresh pasta all the time. It is so easy! I started with a hand turn pasta maker, but have gotten the kitchen-aid attachment. Now I can burn out pasta in no time! You should try it! I probably will, as soon as this weekend in fact. But no pasta machine unfortunately, due to lack of space. We’re talking about a kitchen roughly 6′ x 7′ in size, barely larger than most bathrooms. Wow! That is small. By hand can be fun too! It’s the primary reason why baking isn’t something that I do regularly, and why there aren’t very many recipes for pastries, baked goods and desserts compared to other food blogs. Well, some of that is about to change, simply because I want to teach myself something. Well let me know how it comes out! I’m here if you want a cheering team! I’m pretty sure it’ll work out. Not famous last words! First steps to seeing how much you have missed because it really is easy! You can do it!